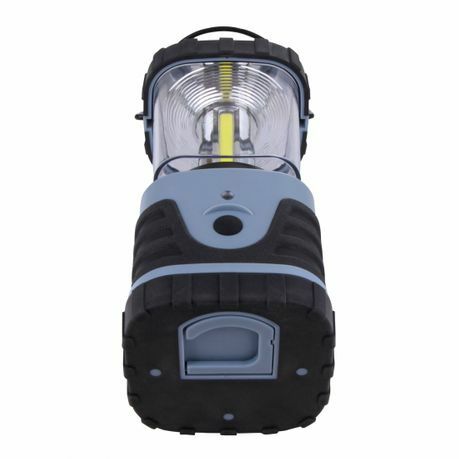 With 500 lumens of luminosity and a beam angle of 360 degrees, the lantern illuminates a large area. The fold-up steel handle guarantees comfortable wearing comfort. In addition, the lamp is equipped with an integrated hook on the bottom, which makes it possible to hang the lamp at various locations. Three batteries or rechargeable batteries of type D supply the luminaire with electricity - these are not included in the scope of delivery. If the full brightness of 500 lumens is not required, the economy mode (300 lumens) can be selected. 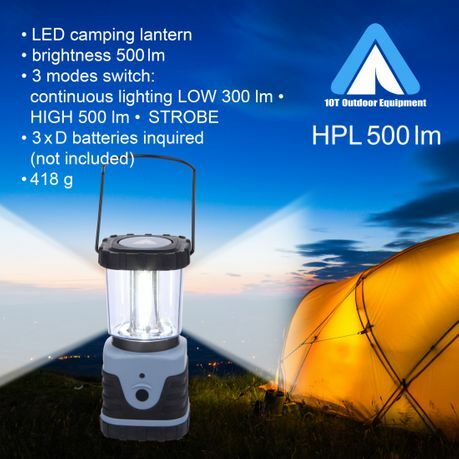 This light intensity is completely sufficient for reading in the tent, for example, and also saves electricity. 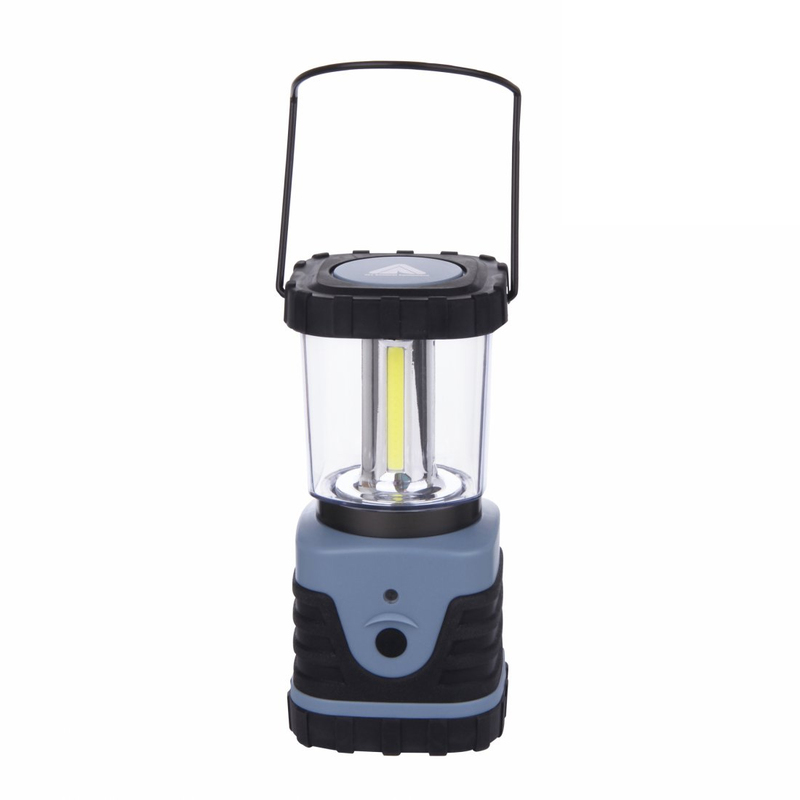 In addition to the economy and normal modes, the lantern has an emergency mode (flashing) that attracts the attention of passers-by and thus provides safety. Depending on the mode, the lamp will last up to 11 hours. The high-quality light emitting diodes have a service life of more than 50,000 hours. Whether at home, in the car, in the workshop, at the workplace, in the office, during sports or on the road - this mobile luminaire convinces with its high-quality and stable workmanship. 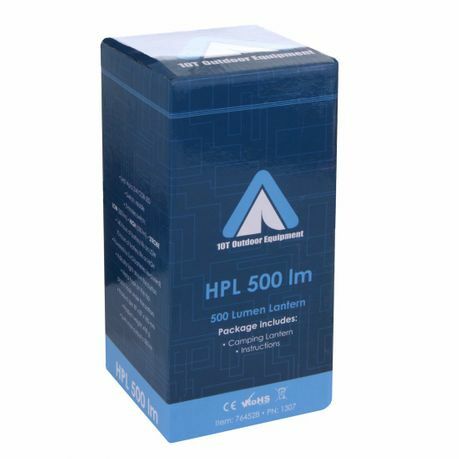 The 10T HPL 500 is a great gift for every camper and craftsman. 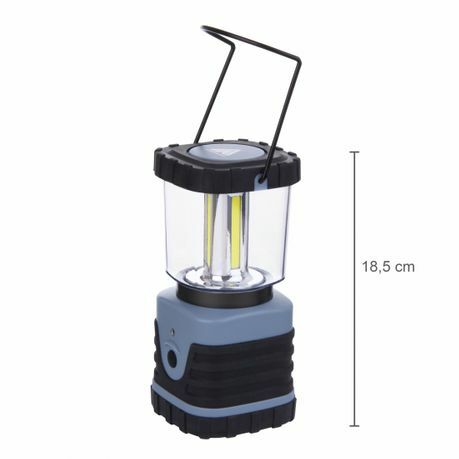 In addition to the economy and normal modes, the camping lantern has an emergency (flashing) mode, which attracts the attention of passers-by and thus provides safety. Foldable steel handle ensures comfortable carrying comfort. It also serves as a point for hanging it from a hook or carabiner. The indicator light shows you whether the batteries used are still sufficient. 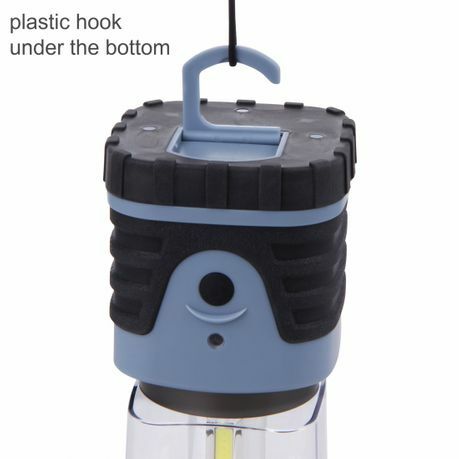 On the floor, the lantern is equipped with an integrated hook that allows it to be hung at various locations. 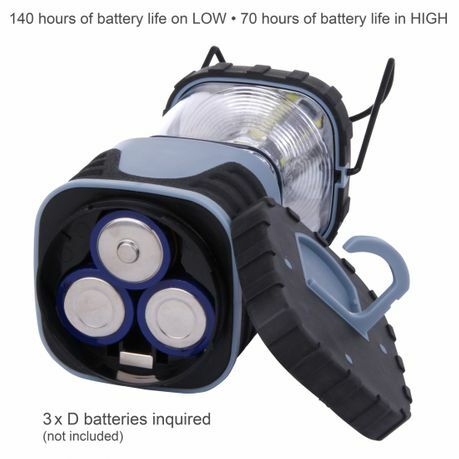 Three batteries or rechargeable batteries of type D supply the luminaire with electricity - these are not included in the scope of delivery. The batteries are located inside the housing after the lamp base has been screwed on. 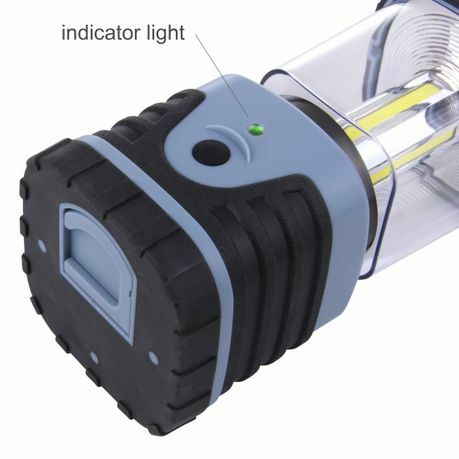 Indoor & Outdoor lamp | bright 500 lumen luminosity | 12 Watt power | 4 COB LEDs - each 3 W power | 4 modes: economy mode (300 lm) - normal mode (500 lm) - emergency mode (flashing) - OFF. 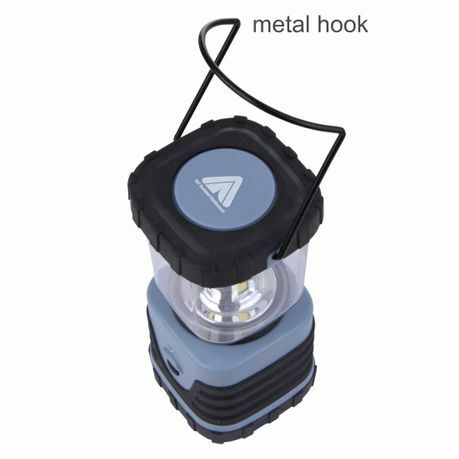 Robust, foldable steel handle for pleasant carrying comfort | integrated hook in the ground and carrying handle allow suspension in the tent, on the tree, awning, branch or beam. 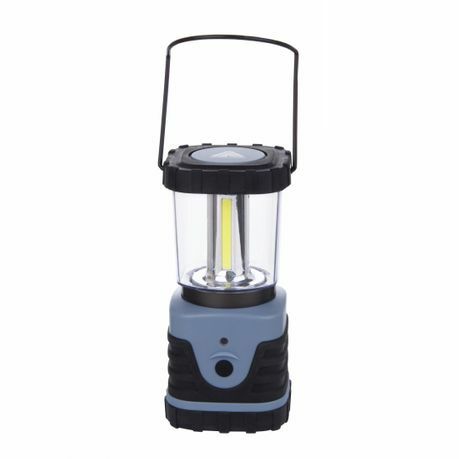 Portable lantern | 360 degree beam angle illuminates large area | Power supply of the lamp by 3 D batteries / rechargeable batteries (batteries / rechargeable batteries not included). 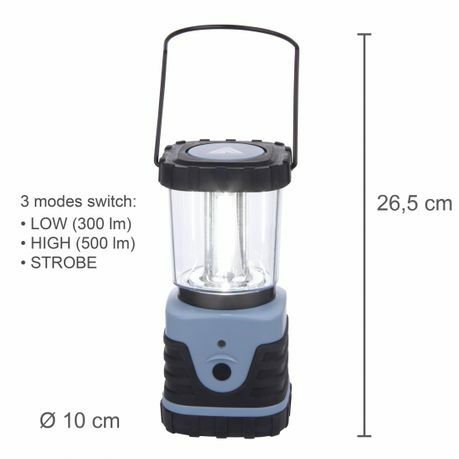 Camping lantern with a diameter of 13.7 cm and a height of 25.3 cm (without transport handle) | more than 50,000 hours lifetime of the LED | lamp lights up to 32 hours.